Beneath the waves, a short distance off the coast of Antiparos, a bizarre and spectacular cave system awaits those brave enough to visit it. That is a characteristic description of how divers feel in the underwater cave of Amfitriti. Curled in a fetal position, they slip through a narrow black hole and enter into the impressive chamber, following the line that has been placed so that no one gets lost. “Only in Mexico and the Caribbean can you see something similar to the cave that is found right here, says the professional photographer and cave diving instructor, Stratis Kas as he opens Google Maps and zooms in on the Panteronisia. 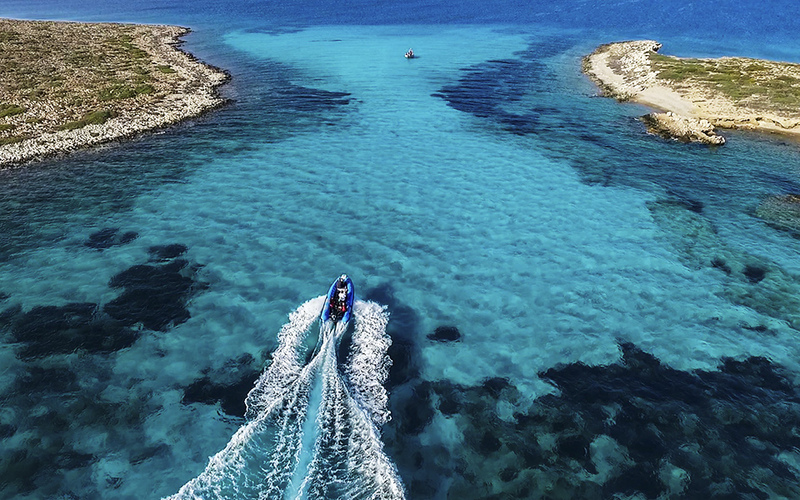 In the summer, this cluster of islets located in the channel between Paros and Antiparos is a haven for sailboats, but the visiting tourists are unaware of the secrets located 50m below the surface. The T2B team getting ready for a dive and performing safety checks. 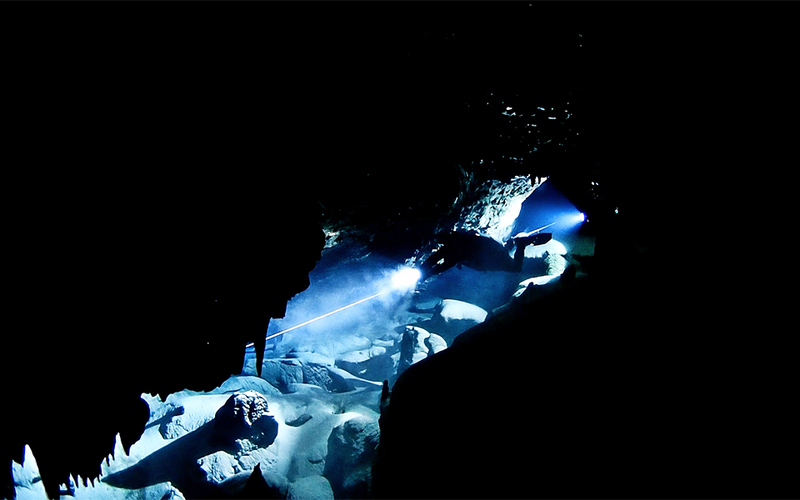 For most of us, just the thought of entering the vast and deep underwater cave is enough to bring on a cold sweat. But for lovers of cave diving, a formation like this is a treasure. “We have freed our minds from fears and we focus on the beauty of the landscape,” Stratis says. Their hobby has a scientific aspect to it as well, as the cave is inaccessible to unmanned subs. Only a human diver is capable of making measurements that are important for climactic and hydrological research. Stratis took his first dive with scuba tanks 17 years ago, fell in love with the sport and has visited dozens of diving destinations from the Bahamas to Mexico. For four years now he has specialized in cave diving, “the most demanding category of technical diving.” He is a member of Top2Bottom, a team made up of cave divers, cave diving instructors, researchers, photographers, film makers, composers, writers and programmers who specialize in the exploration, mapping and filming of underwater caves, as well as providing training to newcomers to the sport. The Panteronisia, a small cluster of islets between Paros and Antiparos hide Greece's most stunning underwater cave. 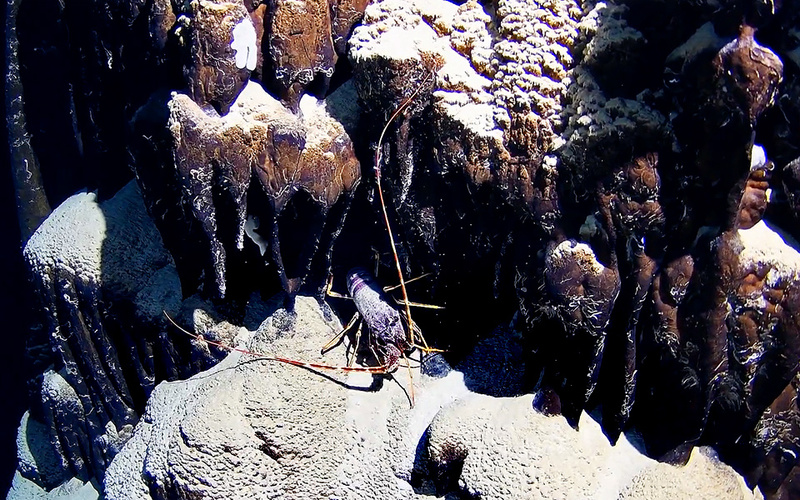 The group initially came together over volunteer efforts to gather fishermen’s nets that had become tangled on shipwrecks, and recently collaborated on a project to create the first professional film dedicated to the cave of Amfitriti (see top). The half-hour documentary was presented at the two-day TEKDIVE Europe 2017 conference, one of the most important meetings about technical and cave diving held worldwide. “We stayed in Antiparos for a week over Easter, we visited again at the end of August and in mid September. 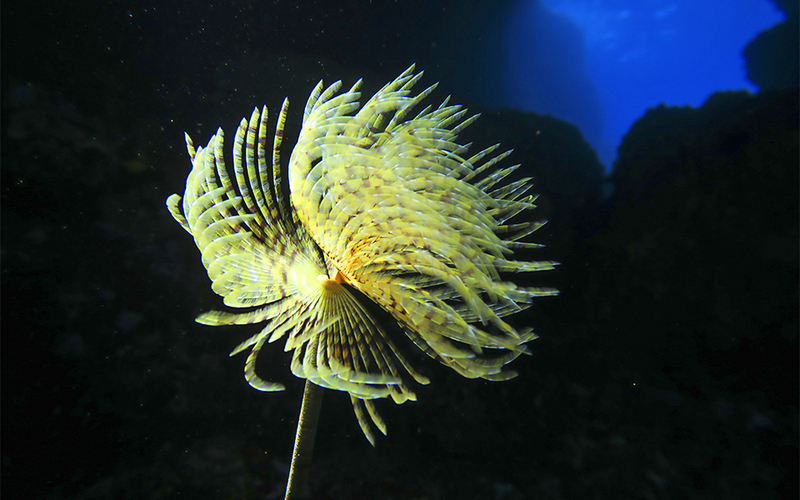 We filmed for a total of 630 minutes underwater,” Stratis tells us. 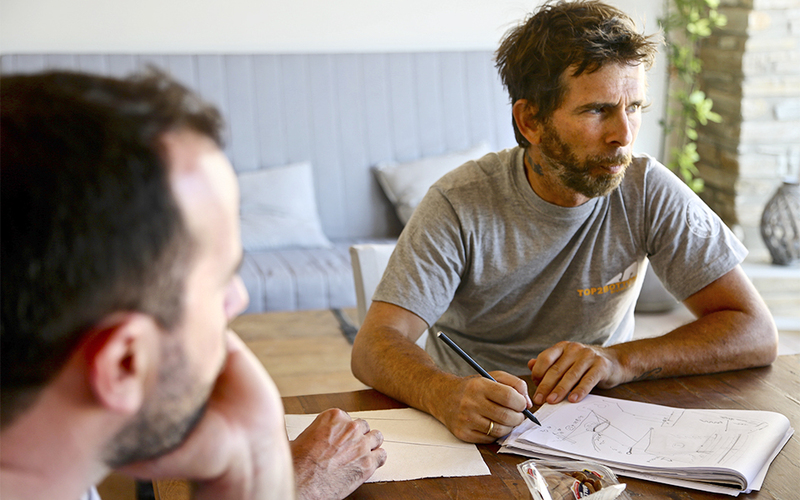 The team’s goal is to lay the foundations for a new form of niche tourism for Greece – attracting cave divers from all over the world to visit the country and explore Greece’s underwater caverns. As a group, cave divers often invest significant time and money in their hobby, traveling frequently to seek out new destinations. 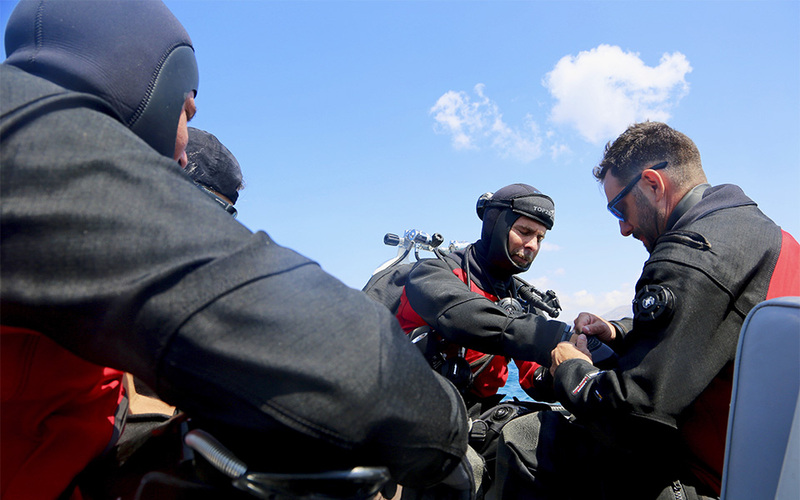 The necessary equipment is expensive, while for an experienced diver to train to become a cave diver costs around 1,500 euros. The Amfitriti cave is widely considered to be the country’s most impressive, while the only known network of underwater caves in the country is located in the area of Arcadikou Choriou on the eastern coast of the Peloponnese. Additional attractions for cave divers in Greece are the Sintzi spring – located near Kandila in Arcadia where a labyrinthine cave lurks underwater and reaches unexplored depths, as well as for the cave lake of Melissani in Kefalonia. Close to Athens the biggest attraction is Vouliagmeni lake, located in a collapsed cave and linked to a system of caverns and underground waterways, while the cave of Korfo in the region of Corinth is ideal for beginners.